Kick Thai Mixed Martial Arts (K-T MMA)… What? Well, this looks like something that will cater to just about everyone who’s a fan of combat sports. K-T MMA (or Kick Thai Mixed Martial Arts) is a promotion that has hybrid rules, one round is straight muay thai, the second is MMA. It reminds me of Bully Beatdown in a way. 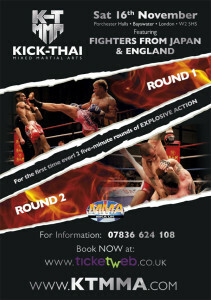 K-T MMA (or Kick Thai Mixed Martial Arts) host their first full show at Porchester Hall in Bayswater, London this weekend, showcasing their hybrid rules format properly for the first time. Fronted by UK MMA pioneer Lee Hasdell and promoter Tim Izli, the show will have fights that have a modified kickboxing rules first round (‘Kick Thai’), and a ‘Global-style MMA’ round, that includes knees to the head of a grounded opponent.